The 1932 terminal had reached its capacity after the war as traffic increased and larger 4-engine aircraft entered service. The first jet engines had been developed during the war and airlines anticipated the arrival of jet airliners within the next decade. 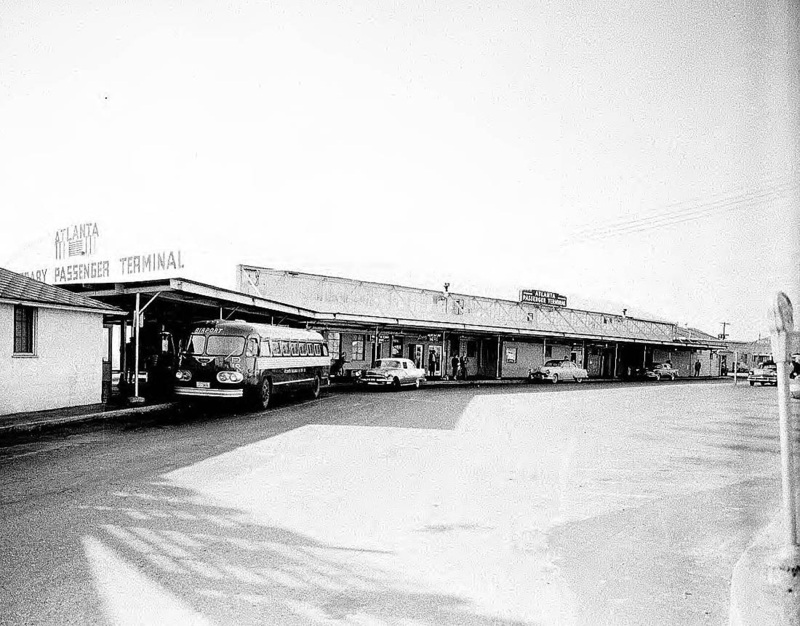 Until it could be determined what type of terminal would be required to accommodate the next generation of airliners, the city created an inexpensive temporary terminal from a quonset-style war surplus hangar. 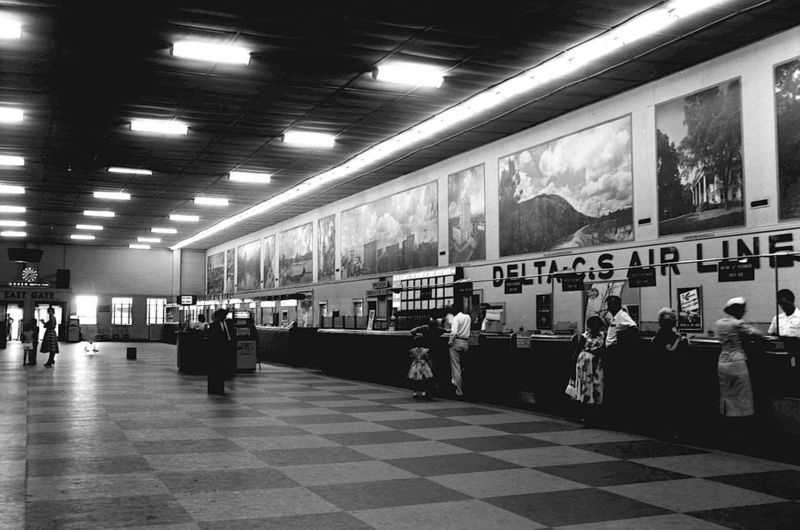 The facility was used from May 1948 until a true jet-age terminal was opened in May 1961. To see where the temporary terminal was located, click HERE. 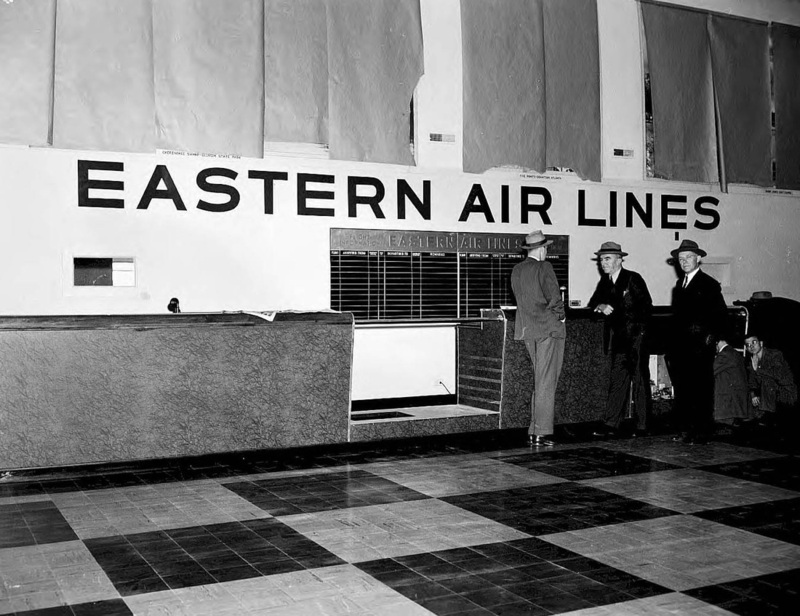 World War I fighter ace, Medal of Honor recipient, and head of Eastern Air Lines Eddie Rickenbacker (center) checks the progress of the temporary terminal on March 30, 1948, about 5 weeks before opening day. The papers on the wall cover large photos of scenes from around Georgia. The one at left is labeled "Okefenokee swamp - Georgia state park" and the one at center says "Five Points - downtown Atlanta". A postcard view of the ticket lobby and waiting area of the temporary terminal. 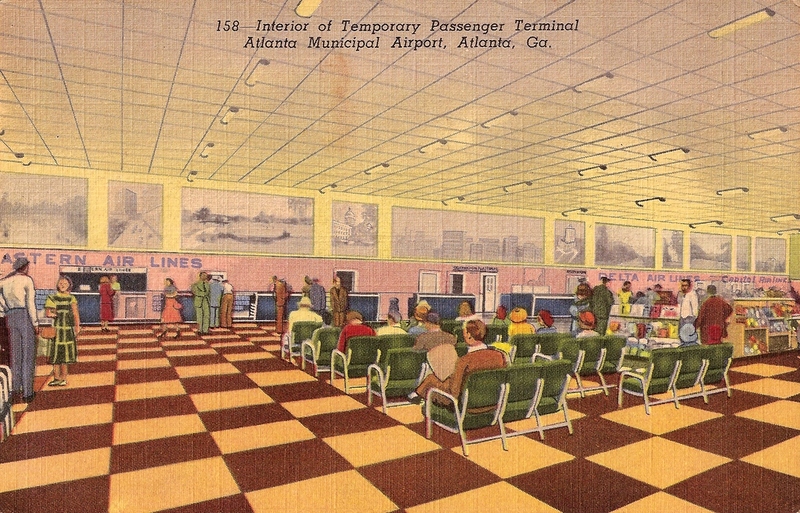 As the postcard states, this was the longest ticket counter in the world when the facility opened in 1948. 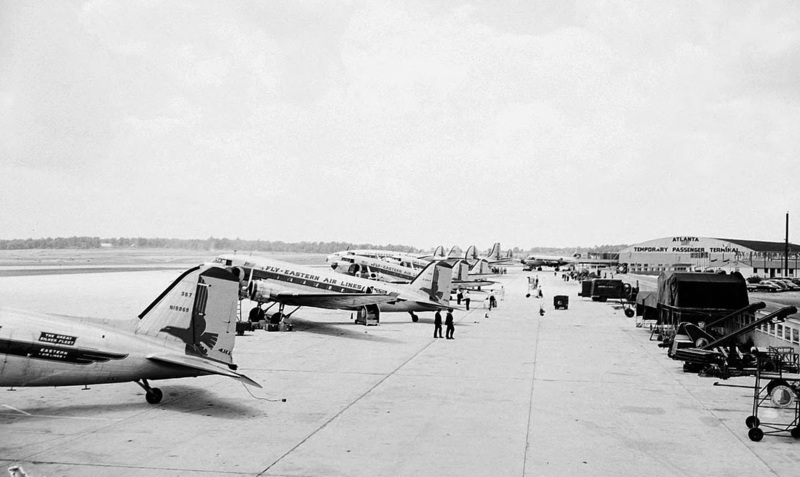 A 1949 view of the ramp along the east wing shows 4 Eastern Air Lines DC-3s, 2 Constellations and a DC-4 with a Delta DC-4 in the background. 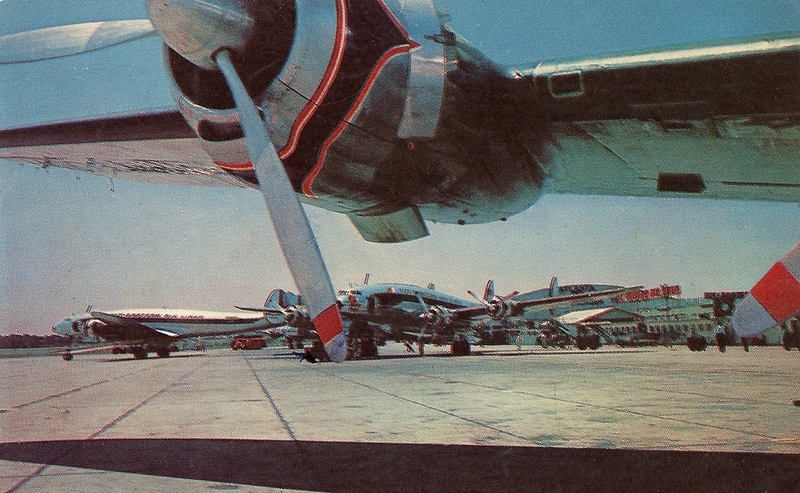 An Eastern Air Lines Lockheed Constellation starts its engines in this postcard view. Note the altered lettering on the terminal from the actual photo above. The word "temporary" has been removed. 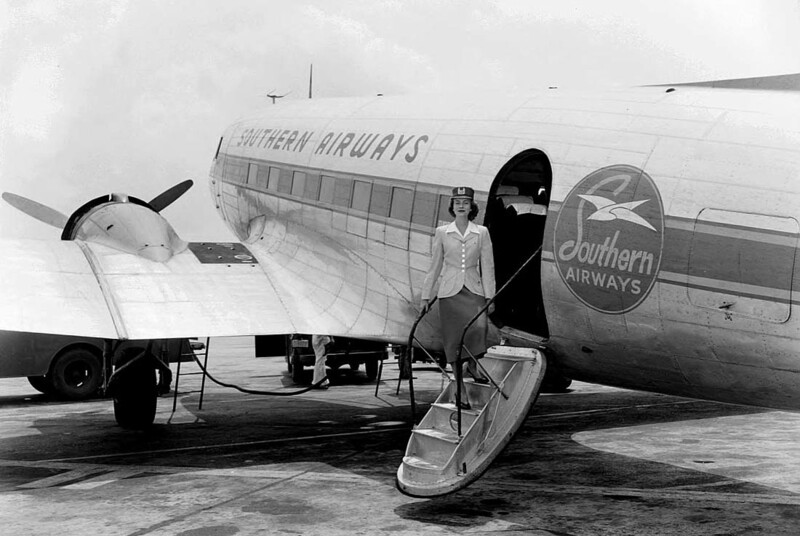 Southern Airways DC-3 pictured at Atlanta in August 1951. Another view of the ticket counters, facing east. 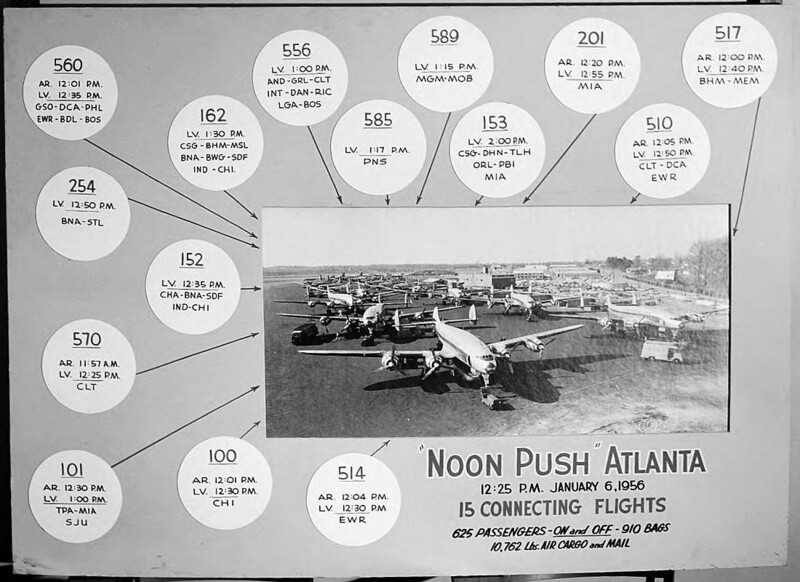 Just below the photo of the Atlanta skyline, at center, were doors leading to the observation platform that overlooked the aircraft parking area. 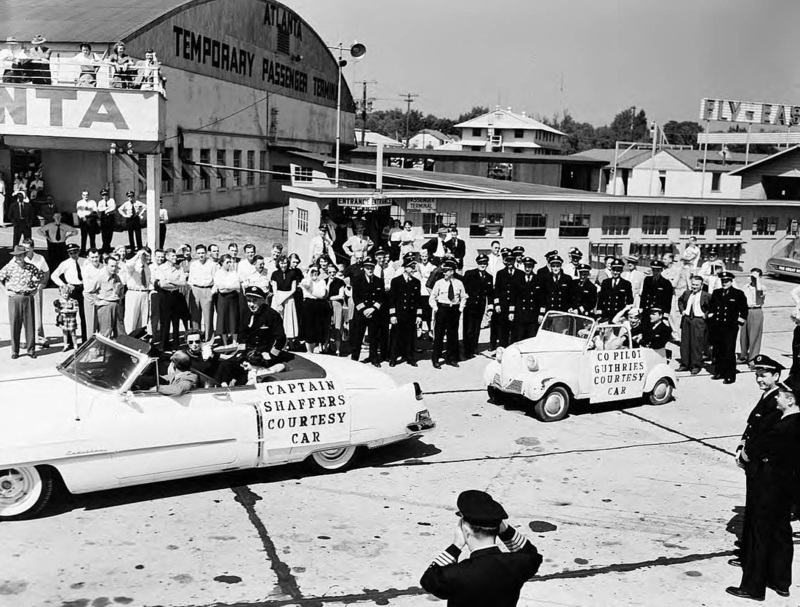 This September 1952 photo of an Eastern pilot's retirement send-off also provides an excellent view of the east exterior of the temporary terminal. The "east gate" doors seen in the photo above led to the walkway seen just below the word "passenger". 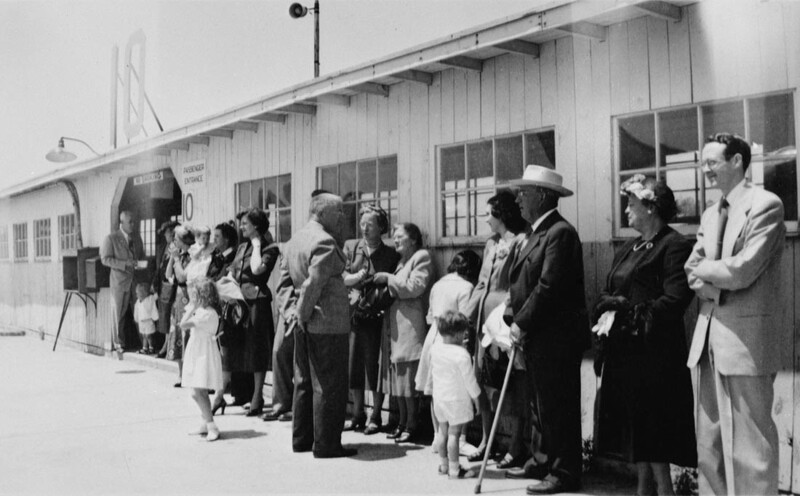 Passengers waiting to board their flight at gate 10 in this 1951 photo from the Vanishing Georgia archives. I have to say, assuming it's not raining or 99 F degrees, I'd much prefer this to the current set-up at Hartsfield-Jackson! 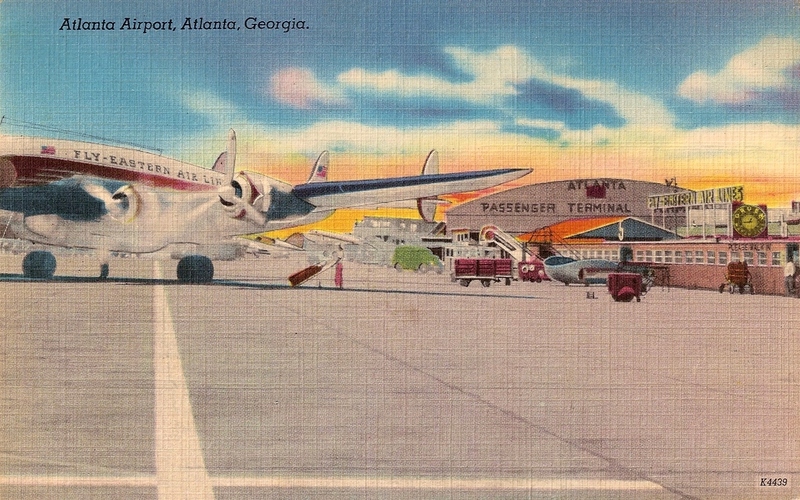 A postcard view of the temporary terminal shows a Delta DC-6 and DC-3 and a Capital Airlines DC-3 at right. Note the second story observation deck. Capital was absorbed by United Airlines in 1961. 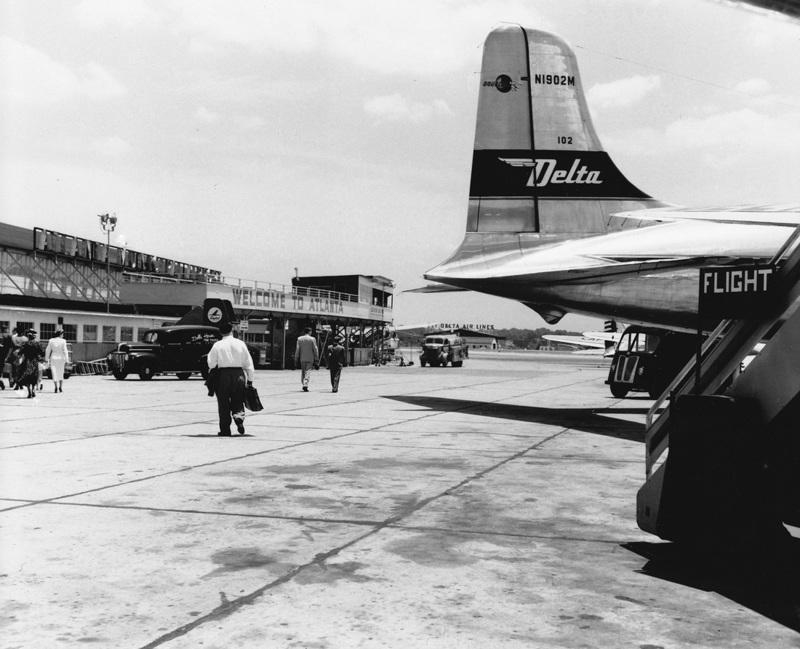 Circa 1950 view of passengers heading to the terminal, dwarfed by the tail of Delta Douglas DC-6 N1902M (msn 43140). This aircraft flew with Delta from 1948 to 1968. The modest curbside view of Atlanta's temporary passenger terminal. 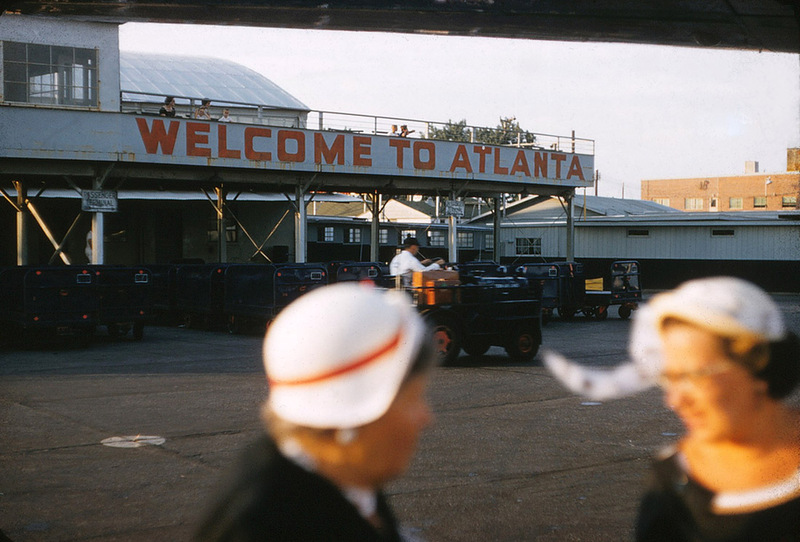 This absolutely fantastic color slide of the temporary terminal comes from flickr user What Makes The Pie Shops Tick? Thanks to Greg Germani for bringing this photo to my attention. I love everything about this: the women conversing in the foreground, the kids on the observation deck watching the planes, the long shadows and golden light of the setting sun. Perfect. This nicely framed postcard view shows a trio of Eastern Constellations on the ramp. 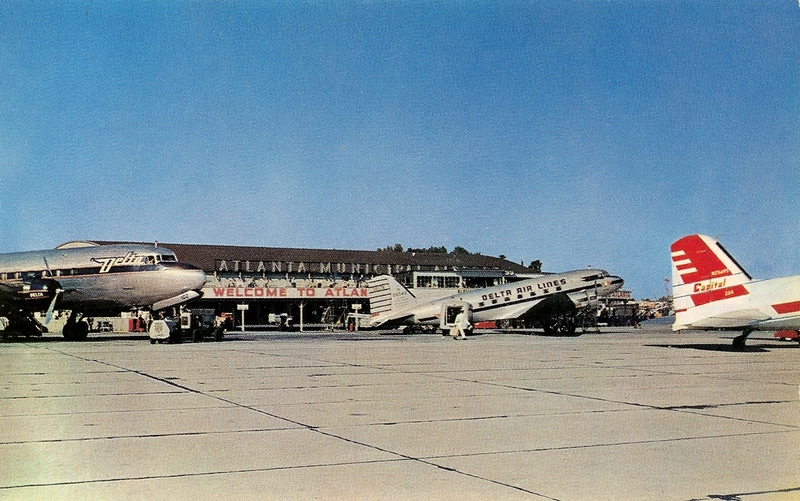 A mid-1950s postcard view showing a Delta / C&S DC-7 and Convair 340/440 at left and an Eastern Constellation parked at the east wing at right. 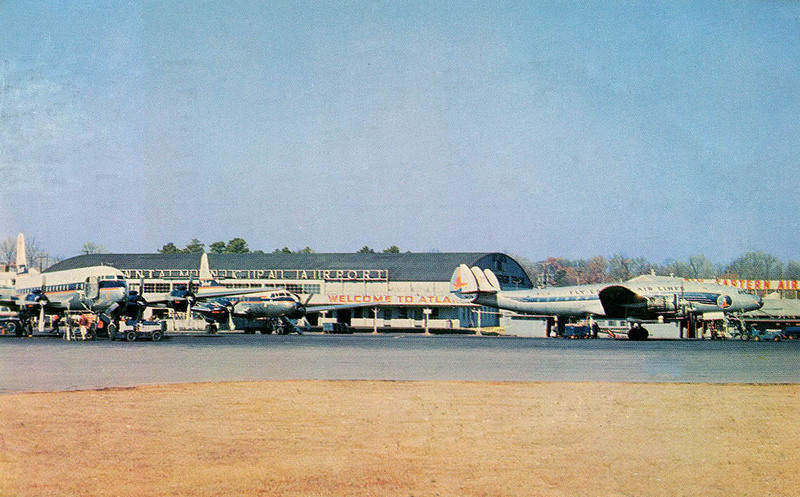 A late 1940s-vintage postcard from the Dobbs House restaurant at Atlanta Municipal Airport. 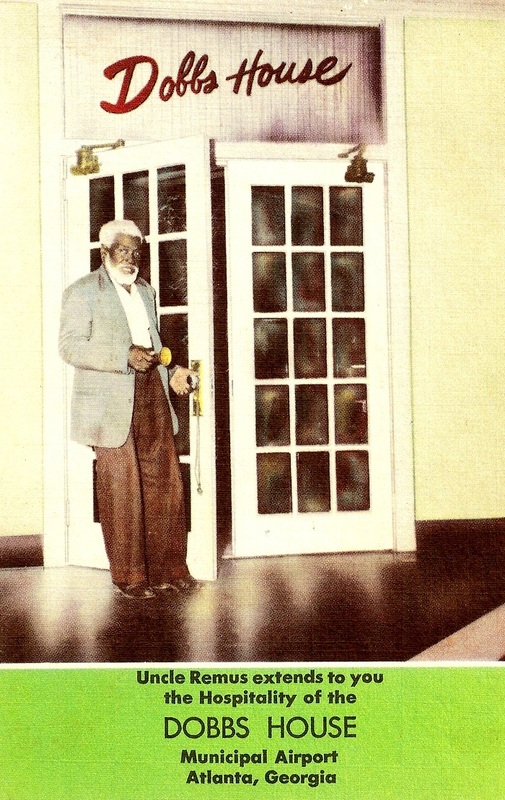 The restaurant based its theme on the stories from Atlanta writer Joel Chandler Harris' book Uncle Remus, His Songs and His Sayings. The entrance to the Dobbs House was decorated with cotton bales, and an African-American employee entertained guests with stories from the book. 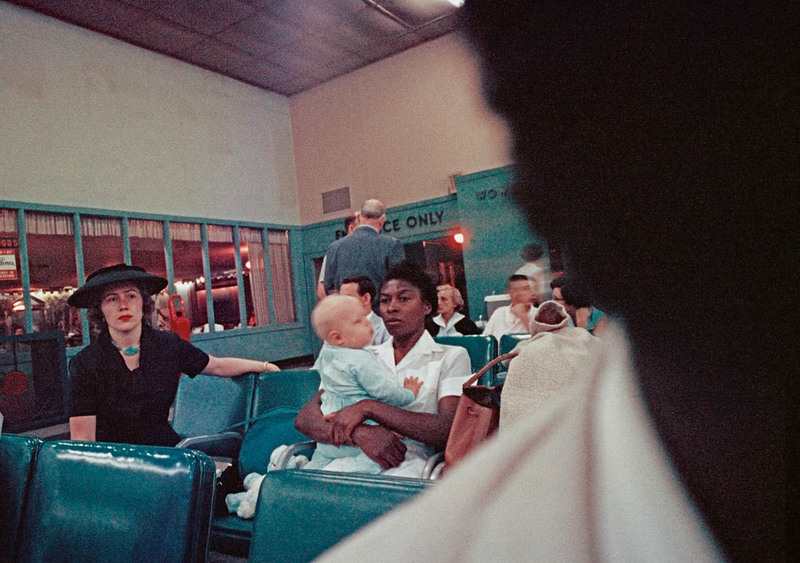 The following two photos were taken by Gordon Parks at Atlanta Municipal Airport in the spring of 1956 as part of his "Segregation" series and are courtesy of the Gordon Parks Foundation. 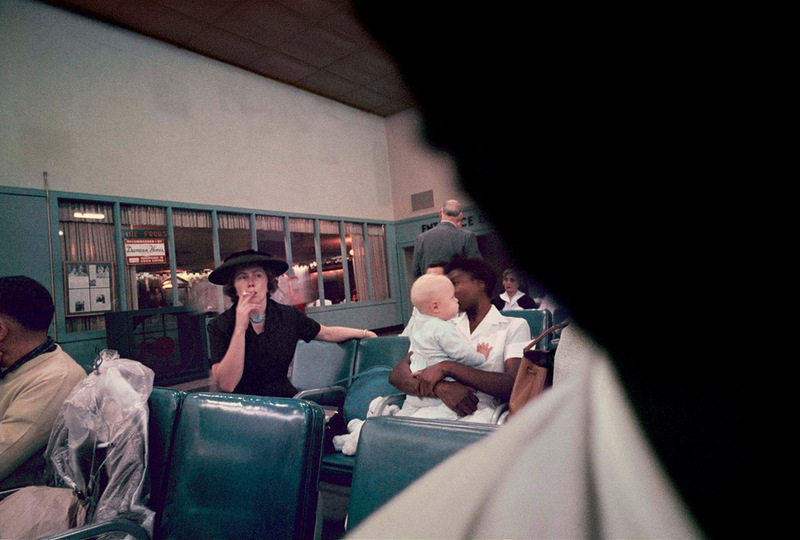 Aside from the fascinating story behind the intriguing images, these are also notable for being the only color photos I have ever seen of the interior of the Temporary Terminal. Here's a photo from the LIFE archives marked to show the location of the above photos and the Uncle Remus postcard, also seen above. 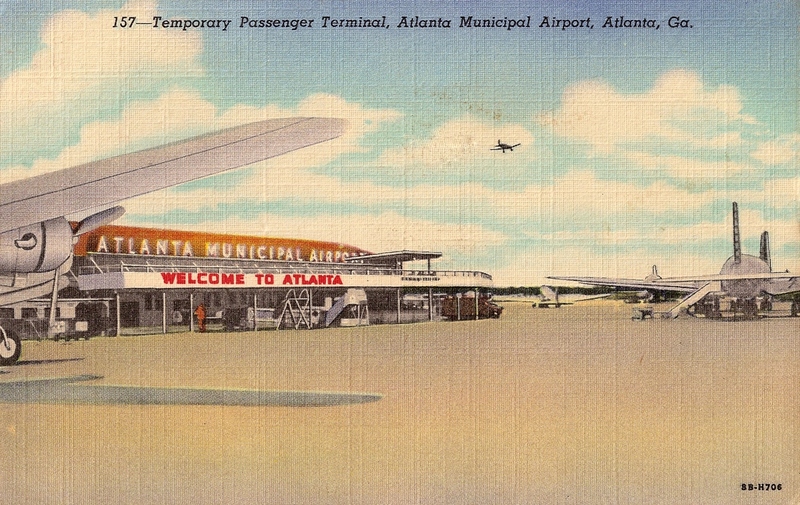 Even in the 1950s, Atlanta airport was one of the busiest air transport hubs in the world. An Eastern Air Lines training poster from 1956 shows the hectic conditions during the "noon push".